The "Courier" received cablegrams last evening stating that Germany had signed the armistice. The first, which came from Washington, via Southport, declared that the State Department had made the announcement. The second message, which confirmed the news, came from Vancouver, via Southport. Shortly after midnight, a further confirmatory message came from London. Other cable messages received state that the ex-Kaiser and ex-Crowned Prince journeyed by motor cars to the Dutch frontier, and were awaiting permission to cross the border in order that the Kaiser might occupy a castle in Holland, placed under offer to him by Count Bentinck. The King of Barveria, accompanied be Prince Rupprecht and his daughters, fled at midnight, and there whereabouts is unknown. Republican leaders in Barveria met the Diet, and a resolution was passed deposing the House of Wittelsbach. The King of Wurtemberg is also reported to have abdicated. It is stated that Schleswig-Holstein will be proclaimed an independent republic. Prince Maximilian, the German Chancellor, has been replaced by a Socialist, Herr Ebert, Prince Max having seemingly become the regent. The German Ministry has resigned, and Herr Ebert is forming a new one. The revolution in Germany has extended from all along the north coast to the southern parts of that country. Riots have occurred in Berlin and Red Guards have occupied the greater part of the city. 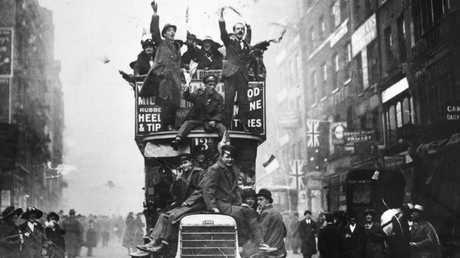 Soldiers's and workmen's Councils have been formed throughout Germany. Speaking at the Lord Mayor's banquet at the Guild Hall, Mr Lloyd George said that Germany was ruined inside and outside. We had no designs on the German people but meant to secure the freedom of our own people. The Allied forces have scored further great successes on the West Front, and the German retreat between the Sambre and Meuse was reported to be in process of becoming a rout. The British and French armies were threatening Mons, and the French were east of Mezleres. 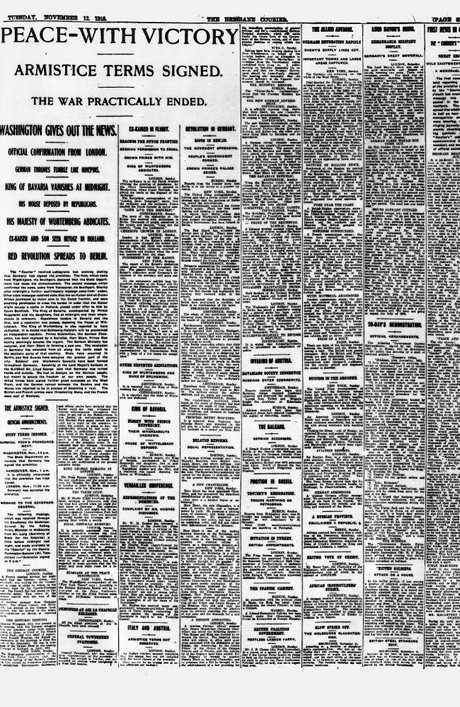 The first news in Queensland regarding the signing of the armistice was received by the "Courier" at 7.28 o'clock last evening, and the message was immediately posted in the "Courier" vestibule. The good news spread like wildfire, and within half-an-hour all over the metropolitan area whistles were blowing, church bells ringing joyously, and excited crowds cheering and singing patriotic songs. 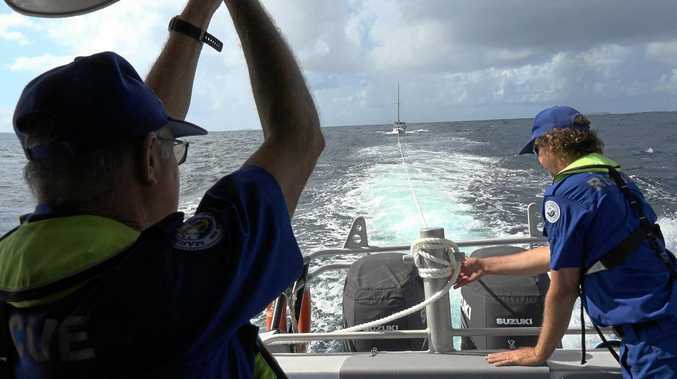 The "Courier's" cablegram was communicated to the Commandant, and made the basis of official action. It is pardonable to go mad at times. This is the only excuse that need be given for the tremendous demonstrations last night in Brisbane. The news of "Peace and Victory" seemed to fly with the wings of thought and in a space of time that seemed incredibly short 50,000 persons gathered in the streets. They were people who, in common with the people of the other parts of the Empire and of glorious France, had sustained the supreme test of a world war for nearly five years: they were people who had made the greatest of sacrifices and who had endured many vicissitudes and had suffered many disappointments; they were people who, when others had rejoiced, had suppressed their excitement until official news of "Peace and Victory" was received. Was it any wonder that they should become intoxicated with joy? For nearly five years there had been a constant and terrible strain on their patience, on their faith, and on their loyalty. And then came news of "Peace and Victory". There was never such a time in the history of the city; never such a time in the history of the Empire and every other celebration, so far as Brisbane is concerned, paled into insignificance. For hours the city went harmlessly mad, justifiably mad, and laudably mad. It cheered, it shouted, it sang, and underlying everything was an expression of pride and of thankfulness. The city streets! They beggared description. Everything came suddenly and unexpectedly. There was a cheer - a feeble yet hearty cheer - in the "Courier" office when the red envelope was opened, and before the news could be written in blue pencil and posted in the vestibule, it seems to be expected in the streets. The words "peace and victory" appeared to fly along the streets, and they were intoned again and again like some religious litany. It was amazing. And then came the outbursts of cheers, followed by the blowing of sirens and the ringing of bells. Within half-an-hour every inward-bound tramcar was packed with citizens. They came from every suburb, every quarter. They came to hear the momentous news and to rejoice. Such a night they had never seen before, nor will ever see again. No rehearsed city scene could equal that of last night. Every city policeman was on duty, but very rarely was there need even for a rebuke. Thousands walked, or were carried along, from the Post Office to the Bridge, and back again, cheering, shouting, and singing, but everything was conducted in the best of good spirits. There were a few minor accidents, because a few persons, either seeking the limelight or bereft of good taste, would persist in attempting to drive vehicles through the crowd. 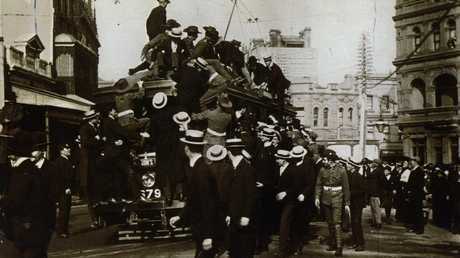 The tramcar traffic in Queen street, however, was stopped, and the thousands upon thousands of people, waving small flags and hats and sticks and handkerchiefs, eddied and swayed through the principal blocks of the city for hours. 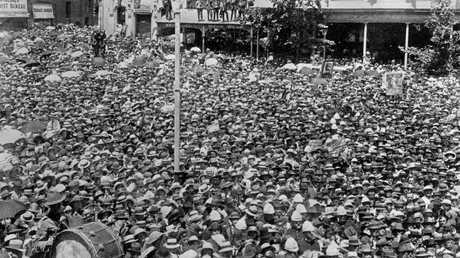 A hundred groups of swirling people sang snatches of the "National Anthem", "Rule Brittania", "Australia Will be There" and "Sons of the Sea". Early in the evening a dense crowd, and wild joyous cheering, heralded the marching of the Y.M.C.A. hut girls in their spotless uniforms. 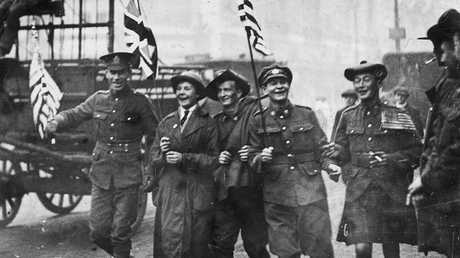 They were accompanied by a body of returned soldiers and as they swung along, with flags waving, and singing patriotic choruses, the scene was thrilling. Following shortly afterwards came the lads of the South Brisbane Sailing Club, with their Club flag and pennants waving. The Brisbane Girls Grammar School boarders, bareheaded, came down in a body on receipt of the good news and lustily sang "Keep the Home Fires Burning". In the earlier portion of last evening a number of returned soldiers attacked a house at the corner of Albert and Charlotte streets, which, it is stated, was similarly attacked some two years ago. On this occasion the door was broken down, and a fanlight and two windows smashed by stones, but otherwise no damage was done. 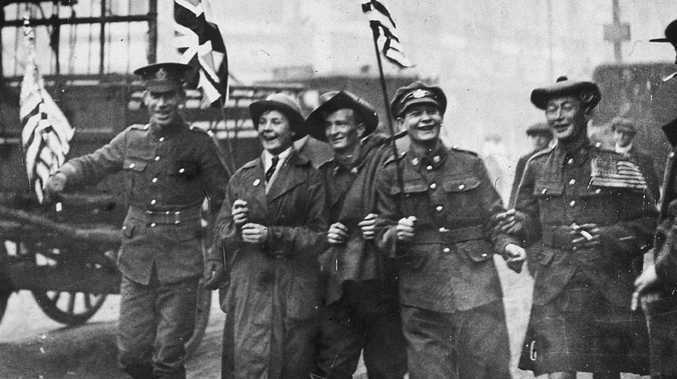 It is understood that some of the soldiers were walking up Albert Street, and when passing the house thought they heard a man there say the Germans had won the war. The soldiers became indignant, and went into town and collected some mates, subsequently returning and attacking the house. This action was evidently taken under a misapprehension, as the police state that the present proprietor is a returned soldier and has two sons at the Front.